Gerrymandering. It’s become the embodiment of so many of the evils in the U.S. political system. Frustrated by the lack of competitive elections? Blame gerrymandering. Appalled by the growing number of ideological extremists in Congress? Blame gerrymandering. What about congressional gridlock? Gerrymandering did it. But gerrymandering — the drawing of political boundaries for the benefit of one party or group over another — is a far more complex topic than some analysts and partisans care to acknowledge. As our gerrymandering series has shown, there’s no “right” way to draw a district. Prioritize one goal — competitiveness or nonwhite representation, for example — and you have to sacrifice others. Perhaps the No. 1 reason people complain about gerrymandering is the belief that it increases the number of legislative districts that always result in blowouts for one party or the other. Former California Gov. Arnold Schwarzenegger, for example, has said that it wipes out competition and that “there are dictators who win by less” than the average U.S. House member. It’s true that the number of competitive congressional districts has fallen dramatically over the past two decades. In both the 1996 and 2016 elections, Republicans won the national House popular vote by a hair.1 In 1996, that small national difference translated into 77 races in which there was a margin of 10 percentage points or less between the Democratic and Republican candidates in the two-party vote.2 In 2016, a similarly tight race nationally translated into only 32 races with a final margin that close. Forty races were within 5 points in 1996, compared with just 15 in 2016. 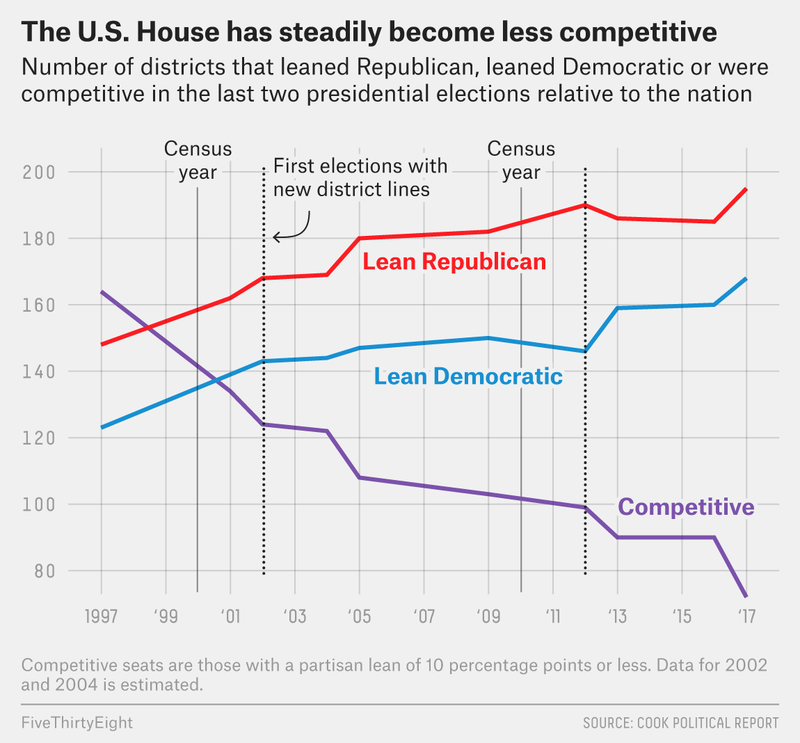 It’s not just the races — the actual districts are getting less competitive. After the 1996 presidential election, there were 164 districts with a partisan lean (how a district votes relative to the nation3) of 10 percentage points or less; that compares with 72 after the 2016 election. What’s behind the disappearance of so many competitive districts? Gerrymandering is part of the story. Take a look at the interactive graphic we built to demonstrate how congressional district lines shift when they are drawn to prioritize different goals. It’s clear that most redistricting schemes that ignore politics and race would yield more competitive U.S. House districts — i.e., those with a partisan lean of 10 percentage points or less — than we currently have. But our analysis suggests that the relative lack of competitive seats under the current map can’t be explained by gerrymandering alone. Under the two redistricting schemes in our interactive that attempt to draw districts to be compact in shape, there are roughly 30 more competitive districts than there are under the current congressional map. That doesn’t come close to taking into account the loss of 92 similarly competitive districts between 1996 and 2016.4 FiveThirtyEight contributor David Wasserman and Ally Flinn calculated that only 17 percent of the decline in competitive districts over the past 20 years was the result of redistricting. You can see this pretty clearly if you look at the votes cast for House candidates aggregated to the state level (obviously, states can’t be gerrymandered). In 1996, the difference in the cumulative House vote for Republicans and the cumulative House vote for Democrats was 10 percentage points or less in 22 states. By 2016, there were only 16 states that close. You can see something similar if you look at how states voted in presidential elections, as well: The number of states whose vote share margin was within 10 points of the national margin dropped from 27 in 1996 to 16 in 2016. It’s even clearer that voting is more homogenous by community than it used to be when you look at counties, whose boundaries also can’t be gerrymandered. If gerrymandering were the sole culprit behind the decline in competitive districts, the number of counties that are competitive in presidential elections should have barely shifted. Instead, there’s been massive movement. In 1996, there were 1,111 counties (about 35 percent of the total)5 where the margin in the presidential vote was within 10 percentage points of the nationwide margin. By 2016, that number had plummeted to just 310 (about 10 percent). Of course, if your goal in redistricting is to prioritize drawing competitive districts, you can improve on the current situation. When we redrew every state map in the country specifically to prioritize competitive districts, we managed to get 242 districts with a partisan lean of less than 10 points toward either party. But there are a lot of other district qualities, such as compactness and keeping communities together, that are important. And when you take all of those factors into account, drawing competitive district maps is much more difficult now than it was in the 1990s. I can understand where Kasich is coming from. There are clearly more extreme representatives in the House now than there were 20 years ago. You can see this trend in DW-Nominate scores, which measure ideology based on roll-call votes on a scale of -1 (most liberal) to +1 (most conservative). When Congress was gaveled into session in 2017, 146 House members were rated “extreme” (i.e., they had scores of less than -0.50 or greater than +0.50); at the start of 1997, that number was 93. And, importantly, there is a connection between the the ideology of a district’s representative and its competitiveness. At the beginning of the current Congress, House Democrats in more left-leaning districts (a partisan lean of at least +10 Democratic) had an average DW-Nominate score of -0.41, while Democrats in more competitive districts had a score of -0.27. Republicans in +10 GOP-leaning districts scored a +0.52, compared to +0.36 in more competitive districts. And because gerrymandering is responsible for at least a portion of the relative lack of competitiveness in House races today, it follows that gerrymanders is at least partially responsible for polarization. Yet the main cause of extremism in the House is probably not gerrymandering. It’s probably the increased extremism of voters, who have better sorted between the parties. As the Pew Research Center has shown, fewer and fewer Democrats and Republicans have overlapping views. In 1994, 17 percent of Democrats had views that were more conservative than the median Republican’s. In 2017, that was down to 3 percent. The same kind of movement has happened among Republicans. In 1994, 23 percent of Republicans had views that were more liberal than the median Democrat’s. By 2017, that number was 1 percent. Overall, the share of Americans who had an equal number of liberal and conservative views declined from 49 percent in 1994 to 32 percent in 2017. Not surprisingly, as voters have moved to the ideological poles, they’ve elected more and more extreme politicians to the U.S. Senate as well. In the Senate, which is unaffected by gerrymandering, the number of extreme members (as measured by DW-Nominate scores) grew from 13 at the beginning of 1997 to 26 at the beginning of 2017. That’s an increase of 13 percentage points, which is roughly the same jump that the House experienced over the same time period.7 If gerrymandering were the primary cause of extremism, you’d expect a bigger increase in the House. 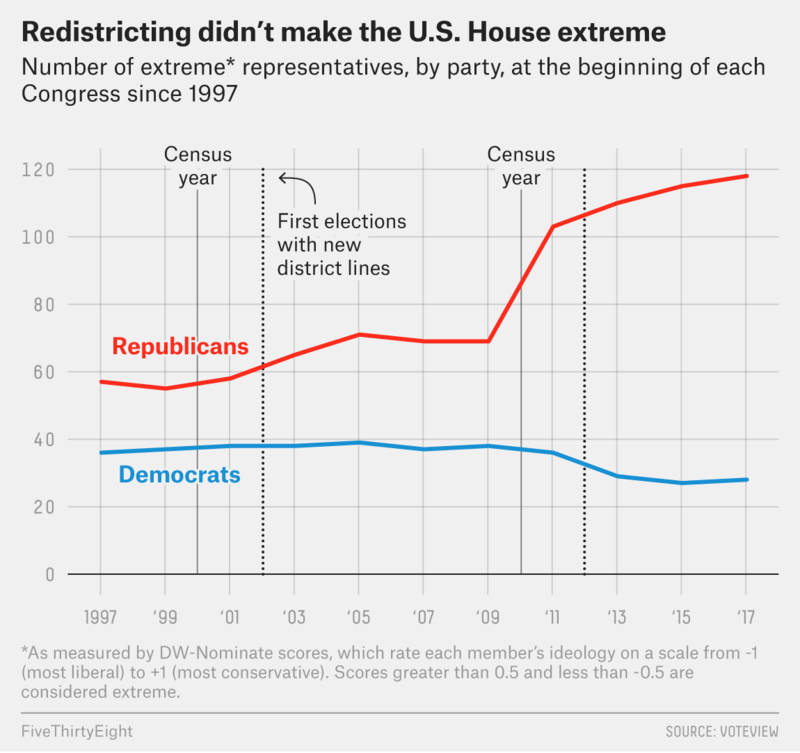 Additionally, the number of extreme members of the House has been steadily increasing over the past 40 years, going from 49 representatives in 1977 to 93 in 1997 to 146 in 2017. If gerrymandering were the main culprit, we’d expect to see big spikes in extremism in the Congresses that immediately followed the drawing of new district maps. But the biggest increases haven’t occurred then. Take a look at the chart above. 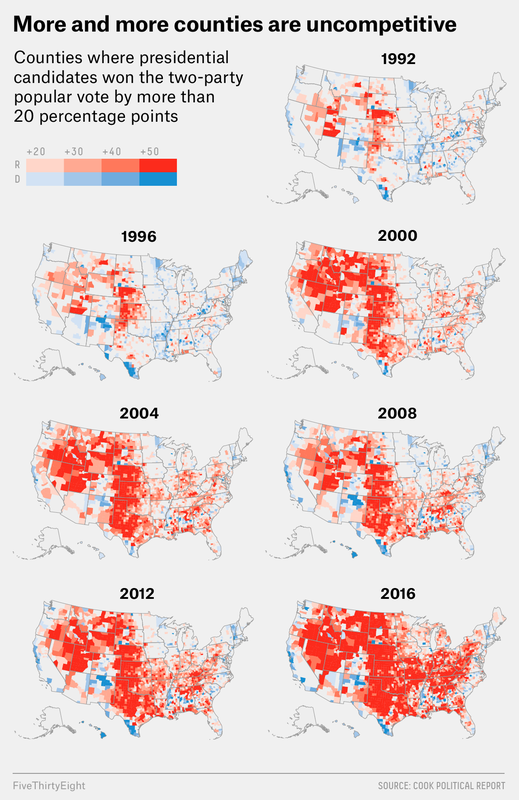 The biggest jump in the past 20 years, took place in the Congress that began in 2011 — before congressional districts had been redrawn in response to the 2010 census. In other words, a lot of the extremism now gripping the House doesn’t have much to do with redistricting. That’s exactly what political scientists Nolan McCarty, Keith Poole and Howard Rosenthal found in their 2009 paper, “Does Gerrymandering Cause Polarization?” They found “very little evidence for such a link” and noted that factors other than redistricting are responsible for over 75 percent of the growing polarization over the past four decades. The bottom line: If you want a less extreme Congress, getting rid of gerrymandering isn’t enough. I think political gerrymandering has resulted in a situation in which — with 80 percent Democratic districts or 80 percent Republican districts and no competition, that leads to more and more polarization in Congress, and it gets harder and harder to get things done. Obama’s not alone. Congressional gridlock is another sin for which gerrymandering needs to ask forgiveness. Of course, for politicians who like the status quo, not passing a new law is perfectly acceptable. But let’s stipulate that gridlock has increased. So what’s causing the problem? If gerrymandering is at least partially responsible for growing polarization and that polarization is in turn causing increased gridlock, then it follows that gerrymandering is at least somewhat responsible for Congress’s inability to get things done. We’ve certainly seen the very conservative Freedom Caucus make it difficult for the House to pass legislation. But as I note above, gerrymandering is not responsible for most of the increasing extremism in the House, and it’s not even clear that the House is primarily to blame for the lack of legislation coming out of Congress. Instead, the more likely culprit is the Senate — in particular, the Senate filibuster. To end most most filibusters in the Senate, 60 votes are needed, which means that passing legislation generally requires more than a simple majority (51 votes). The mechanism for ending the filibuster is called “cloture,” and to initiate a vote on that, senators must first file a motion. Those filings can be used as a rough estimation of Senate gridlock — they can show when there’s been an effort to block something from coming to a vote. And they have risen in number considerably over the past two decades. From 1993 to 2002 — which covers the five Congresses that operated under the maps drawn after the 1990 census — the Senate averaged 75 cloture motions per session. From 2013 to 2016 — which covers the two full Congresses held under maps drawn after the 2010 census — the Senate averaged 190 cloture motions per session. That’s a sign that the minority party in the Senate is making it far more difficult for the chamber to conduct its business. Let’s look at this another way. If gerrymandering-created polarization were the main cause of gridlock, we’d except the number of bills that pass the Senate but not the House to have grown over time.10 But that’s not what has happened; in fact, the number has dropped. From 1993 to 2002, an average of 197 bills per Congress passed the Senate but not the House. From 2013 to 2016, the average was 88. Meanwhile, the number of bills that passed the House but not the Senate went up — from an average of 325 in 1993-2002 to 475 in 2013-16. That too suggests that the Senate, not the House, is the main driver of gridlock. Most Americans don’t think the country is headed in the right direction. They hold Congress in extremely low regard and have little trust in government. In such an environment, the idea of a big fix holds a lot of power. If we could pin all the problems plaguing our political system on one thing, they’d be much easier to correct. But the end of gerrymandering would be no panacea. Indeed, gerrymandering may be just as much a symptom of America’s political problems as a cause. 0.1 percentage points in 1996 and 1.4 points in 2016. That is, excluding votes for independent and third-party candidates. To calculate a district’s partisan lean, we took an average of the difference between the nationwide and district margin in the last two presidential elections. Again, we excluded votes for independent and third-party candidates. FiveThirtyEight contributor David Wasserman and Ally Flinn’s previous analysis of the number of swing districts that disappeared because of redistricting has a similar finding. The partisan lean numbers for 2002 and 2004 in Wasserman and Flinn’s analysis, as well as the chart below, are estimates, because we don’t have calculations for how the newly drawn districts voted in the 1996 presidential election. This includes county equivalents such as the city of St. Louis in Missouri but does not include Alaska. Neither The Associated Press nor Dave Leip’s Atlas of U.S. Presidential Elections released county equivalent results for Alaska in the 2016 presidential election. The lack of results from Alaska makes no significant difference to the findings presented here. Theoretically, a lawmaker could take a mix of positions on the extreme left and the extreme right that average out to “moderate.” See here for more on that. From 13 percent of senators to 26 percent, and from 21 percent of House members to 34 percent. The number of bills passed by Congress is an imperfect measure of its legislative productivity, but we don’t have many better ones. GovTrack’s historical bill tracking starts with the 1973-74 session. Like other measures, this is simplistic. It doesn’t, for instance, take into account which party controls each chamber. Or that a Senate that might not want to take up a bill that the president is unwilling to sign. The gerrymandering case currently before the Supreme Court, Gill v. Whitford, is focused on Wisconsin Assembly districts.